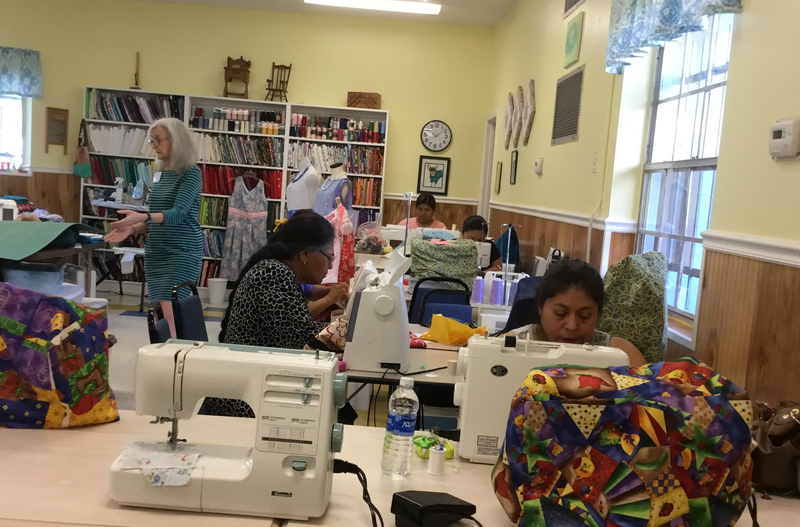 Atlantic-Midwest Province Associate Daphne Queen shares her SSND Mission Awareness Program (MAP) experience while in southeast Florida from May 13 – May 19. During the MAP program Daphne lived with School Sisters of Notre Dame and had the opportunity to help the homeless and immigrant families. All reflections below are written by the SSND associate Daphne Queen. Never Take For Granted My Blessings! Scriptures: Psalms 103:2-6 (specifically, verse 2) – Praise the Lord, O my soul, and forget not all his benefits. 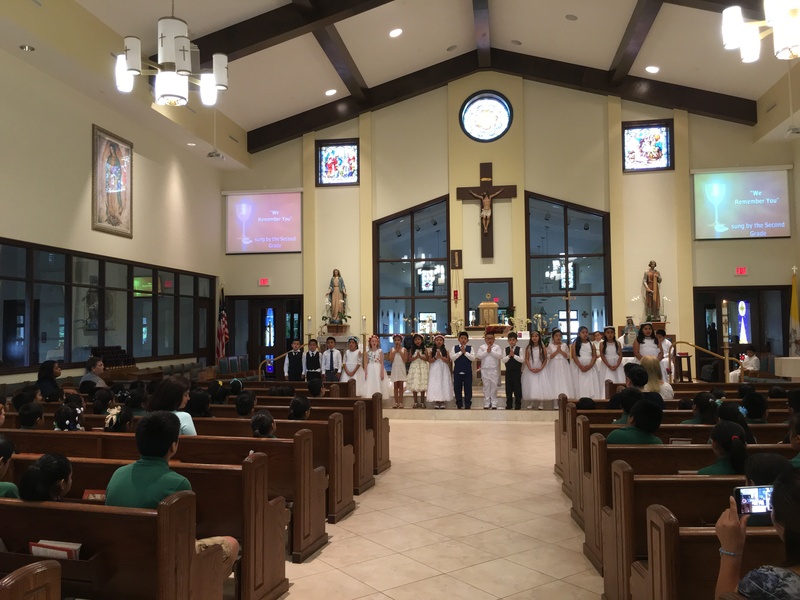 Childern celebrating “Crown Mary May Day” at The Holy Cross Catholic Church (Indiantown, Florida). The children are from the St. Ann’s Catholic School that Sister Mary Dooley and Sister Kate Kinnally founded. On this day while serving at one of the best mission programs of compassion and love, I felt extremely humbled. St. Ann’s Place exemplifies the gift of charity for all God’s people. It is the first time I ever felt like I could never give enough to those persons coming for assistance. All that I had to give of myself let me know with a resounding voice in my heart’s spirit that I needed to step up my game! My heart kept reminding me you have too much; way too many of all types of “things” at home yourself. What good is it for when you don’t even think of the cost or the value of having too much, while others have so little! The voice in my heart, mind and soul was saying to me, pay attention to the many resources you have been given, because you should never take for granted your blessings that have been given to you abundantly. So many people are in need, but they do without! They don’t have the means that you do, and there are many reasons why they lack the goods that would make their lives better. I began to realize that I really couldn’t imagine all of the reasons why their lives were different from mine, and the difficulties they have gone through that left so many of them homeless. I began to feel homeless too, but it was inside my heart. The tug was so strong! My heart longed to make a difference and every second counted as I worked to help our brothers and sisters. So, I asked myself: “What does homelessness feel like when you see the need to rid others of their homeless conditions and make their lives better?” What lessons am I being taught through this volunteer experience? Why do I feel a little ashamed of having too much and for storing up goods that I will probably never use? Why do I give a lot to the poor, but I have a lot more I could be giving now? When my work is done here, why did the Lord lead me down this path at this time in my life? Where will my next meal come from? Where will I place my head down to sleep during the day when I get tired or at night when it’s time to retire and rest? Where will I get a bath and clean clothes to wear, because I’ve worn these clothes I have on for too many days? Where will I get the money from to buy my medicine? Where can I get a haircut? Where can I get a rain Poncho? It’s been storming every day since I arrived on Sunday, and the rain is flooding all of my surroundings outside. Where will I pick up my mail from, because I don’t have a residence? Where will I get my bus pass from to help me make my appointments? Can I have an extra sandwich? I like a ham sandwich better than a bologna sandwich! Can I get an extra cup of coffee? I like cream and sugar in my coffee. I want two scoops of cream and two scoops of sugar. Can I get something to drink other than coffee? I like juice, soda or water! Can I have a bag of potato chips? I don’t like Doritos! Can I get help so that I can get my food stamps? I don’t have an identification card or birth certificate! Can I have an extra bag lunch for my friend? Where is your friend? I need to take the lunch to him or her, because they are standing on the bus stop waiting for me. Can I get an extra lunch for my father, mother, brother, sister, husband, or child? I don’t have a car, so I couldn’t bring them with me to get a meal. Can I get a carton of milk for my child? Can I have an extra dessert? I like chocolate chip cookies. Give me four or five cookies, please. I’m really not supposed to have them, because I’m diabetic. Can I get something to eat right now? I don’t feel well, because I haven’t had food for a while and my sugar count is down. I may need to go to the hospital, because I feel like I’m going to pass out! Why aren’t you listening to me? I responded: “Yes, I’m listening to you.” Nevertheless, the homeless sometimes have trouble comprehending my response to them. However, quite a few of them feel I’m not treating them right. No matter how compassionate and kind I am, it’s not enough or unacceptable to their mindset and world of problems. They say, “Why are you looking at me the wrong way? I said: “No, I’m not doing that, I’m just trying to help you in love! What time is the window closing today? The response is the exact same time as it was yesterday (i.e., Monday through Friday)! Breakfast is served daily from 8:00 – 9:00 AM. Coffee, breakfast pastries, fresh fruit and cereal are served. Lunch is served from 10:00 to 11:30 AM. Can you help me pay my rent? I almost have enough, but my check is too small. My husband’s check and mine together is still not enough to pay rent. We can’t even begin looking for a place suitable for our income, because we don’t have the security deposit/s to begin with! Can you help me get a job? I need a job and so does my friend. I’m staying with my parents, and they are aging. They want me gone, and I have only a few days before they put me back on the street! I could go on, and on, and on with the unending thoughts of TRUTH! The questions just kept on coming very rapidly. I don’t have all the right answers for our brothers and sisters needing our help. But in times like these, I’m desperate to find a way to make a difference in as many lives as I can. St. Ann’s Place has shown me how to do that in the spirit of UNITY and LOVE! Their state-of-the-art hygiene center offers God’s people a way to be fed; get cleaned up with daily baths; receive clothes to call their own; and social services that help them get back on their feet, while keeping their dignity and HOPE! The following Saint Ann’s Place mission summarizes the gift that was given to me as a missionary and Associate with the School Sisters of Notre Dame, including the homeless community coming from various cultures and walks of life. On this rainy day, I looked into the eyes and mouths of many soaking wet people. I also listened to the voices of many people crying out for help, who spoke many languages! On a normal basis, I don’t usually take in as much chatter into my heart and mind from strangers. I care about what people are doing and saying in this homeless program setting; however, my lifestyle is completely different, I thought! I believed I knew what I was dealing with in communal relationships and daily interactions with others at home, work, church and in neighboring communities in the Randallstown, Maryland area. Surprisingly, this Tuesday, something different was happening all around me, as I provided support to the other volunteers at St. Ann’s Place in West Palm Beach, Florida. My mission trip was about to teach me some uncomfortable truths, but life changing! However, tonight as I write these words, I wonder if I really know myself, family, friends, relatives and co-workers any different, than from the perfect strangers I met today. The one thing I do know for sure is everyone’s heart beat the same way, and God created all of us to be in unity, as one body in Christ Jesus. If God had not changed me and saved me, would I be able to feed, clothe, and spend time with people who live differently, because they are living in poverty, some in extreme poverty? Well, what about the people who have abundant blessings, but they are living in poverty too? Predominantly, because their poverty comes from the inability to LOVE all people; refusal to FORGIVE those that hurt them; have prejudices against the color of one’s skin; a divided world view; anger for the wrong reasons and so on…and on! I could go further explaining these examples, but I would probably run low on paper in order to tell this story as it should be told. Therefore, I searched my heart deeply. I began to ask myself MORE questions in my mind and soul, with overwhelming thought reminders of how God knows what’s in my heart, and He is paying attention to me and the homeless men, women and children. Jesus loves all of us unconditionally, no matter what we say or do! In summary, we all need nourishment from food (manna) to live! The manna that God provides will keep everyone from being hungry, and He doesn’t have favorites. He feeds the just and the unjust! No one wants to be homeless. Having a home and a place to rest our heads is a blessing. God has provided all our needs and everything He made is good! Our Father wants all is children to be comforted, clothed and loved. The VOICE inside me conveyed, I suggest you check yourself in your thoughts, actions, words and deeds. We are not to judge anyone! In the Bible, the Book of Isaiah teaches us that God wants us to come to him for food and drink. He will give you what you need and it’s FREE!!! God provides the delights, and they are the richest of fare. Be a witness like David and lead people to Christ. Lead His people by giving them what they need, if you have it to give. God will make a covenant with you if you do His will! When in doubt or confused, ask yourself the following DIFFICULT questions like I did for myself. Then ask God to clean your heart. Let Him change you in ways that will surpass your understanding. You won’t regret it, you will rise to every occasion to help yourself and help other people! The good and the bad things that happen in our world will work out for the good. That is the way God intended for his power to be revealed…in EVERYTHING and EVERYBODY!!! Peace and love to you always. Why did I serve the gentlemen today who made sure I knew he specialized in the evil practices of Voodoo? Why did I serve the man I assumed was a drug dealer, because his entire mouth was full of gold teeth? Why did I serve the woman who had a filthy mouth, and she called God’s Name in vain in every mouthful of words she spoke? Why did I serve the man or woman who claimed he/she were getting an extra meal for a friend or family member, but most likely it was for themselves? Why did I serve the person who was emotionally unbalanced, because he/she couldn’t even tell me the type of sandwich they wanted to eat? Why did I serve the person who didn’t smell so good when he/she arrived at the window to get breakfast and lunch? Why did I serve men and women that looked healthy enough to be able to work and earn a salary for buying their own food? Why did I serve the young teenage boys and girls, who looked astute and strong, without a problem in the world? Why did I serve the grandmother that came out in the rain to get food for her “grown” children that she loved so much? Why did I serve the person just released from prison? Why did I serve the alcoholic that wanted you to know he/she loved liquor better than food, but they had to eat to live? Why did I serve the drug addict that only wanted to eat all the sweets I offered, more than the healthier food? Why did I serve the disabled man or woman that could hardly walk or who had lost a body part? Why did I serve men and women who came for breakfast and lunch, but said they were going back to work afterwards? Why did I serve the pregnant mother who talked more about her boyfriend or her man, more than herself? Why did I serve the man that challenged my faith, compassion and reasons for helping him? Why did I serve those people who talked like they knew everything and told me that I needed to do more for them? Why did I serve the people that was thankful and polite for the services I provided? Why did I serve the person who wanted to harm me when they didn’t get their way? Why did I serve the trouble maker who disturbed the crowd, while everyone was standing in line? Why did I serve the person that jumped the line, because he/she believed they should go first at all times? Why did I serve the person when the food was almost out, but I scratched everywhere to find enough food for them not to leave hungry? Why did I slip some of the people extra sandwiches and treats? Why did I keep repeatedly serving the same meal types, but the people wanted something better that I did not have to give? Why did I keep serving and standing on my feet for long hours, and my body was telling me I’m tired? Why did I make sure I had kind words to say at all times when interacting with the people? Why did I share my faith with persons who didn’t care about any religion? Why did I have the courage to tell them about Jesus, the Alpha and Omega, the Beginning and the End? Why did I think what I was doing really made a difference? Why did I decide to volunteer to serve at St. Ann’s Place in the first place? Why do I continue to serve in the community market place often and tell other friends to join me in these efforts? Why do I donate to various charitable causes and believe that I am making a difference in the world? Why do I think I have a servant’s heart and that Jesus chose me to do this work in the kingdom? BECAUSE JOHN 3:16 TELLS US: FOR GOD SO LOVED THE WORLD, THAT HE GAVE HIS ONLY BEGOTTEN SON, THAT WHOSOVER BELIEVETH IN HIM SHOULD NOT PERISH, BUT HAVE EVERLASTING LIFE! KJV – AMEN!